After years of selling services (FedEx) and software (SAP, Microsoft) I was ready for a new challenge. Sponsorship combines my experience in complex sales plus the added ability to be creative in solutions. I have signed 45 new sponsors since I started. Listen and help solve problems with custom solutions. Don’t pitch. 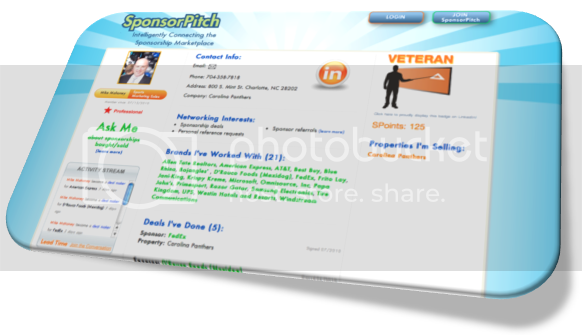 Michael Munson from SponsorPitch reached out via phone about the concept and about past sponsorship software offerings. Michael had good ideas about how to collaboratively solve the challenges that sponsorship sales people face. I believe that we can help each other and there is enough business to go around. I won’t lose business from clients that know me, like me, and buy from me when I am meeting their business goals. If their needs shift that won’t be because I shared contact info with another property and I feel that others would believe that as well and share their information. Get to know other sponsorship folks. I don’t think I’ve met someone who was not helpful. Also there are a lot of great people and resources on Twitter. Try it, even if only to listen. Ahead of the Curve is a regular interview series featuring professional members of SponsorPitch, a peer-based social research and networking site for sponsorship professionals. If you'd like to be featured, become an active member of the SponsorPitch community. To learn more about what the new SponsorPitch is all about, get in touch with a member featured in the Ahead of the Curve interview series.